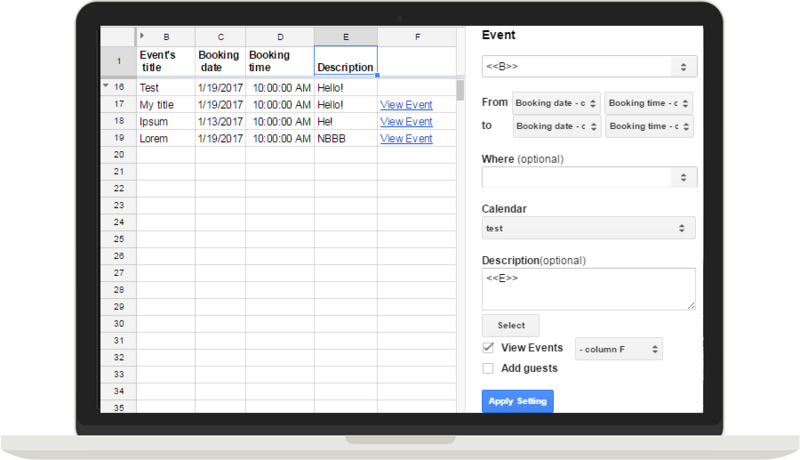 Use Google form for booking events. Booking events will be shown in Google calendar. The booking(s) from Google Form will automatically show in Google Calendar when the form was submitted. In just a few clicks, you can create multiple events from your spreadsheet. Any changes on the spreadsheet will automcatically reflect in the Google Calendar. You can actively send an email to the support team regarding any issues. Debit or credit cards (Visa, MasterCard, American Express,...) are accepted. Paypal account is accepted. 3. Third, click Apply Setting to save the setting. How to use google sheets to create an event? 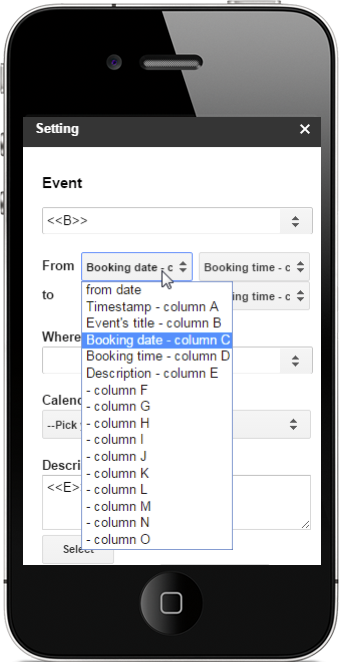 Select the entire row or any cell in a row, then choose Add-ons menu → Calendar Events Creator → Create Event(s). 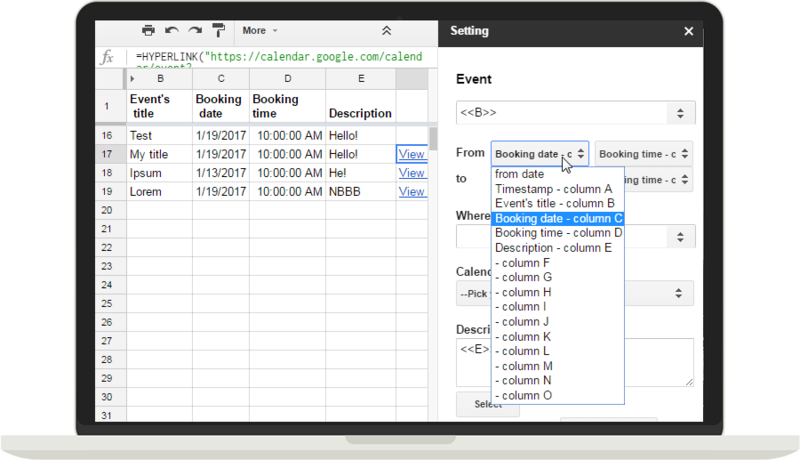 How Google Sheets creates multiple events to Google Calendar? Note: Due to limitations for Google Services, create less than 25 events at the same time for best results. How to update event(s) automatically? When user changes the event's value, the created event will be updated automatically. 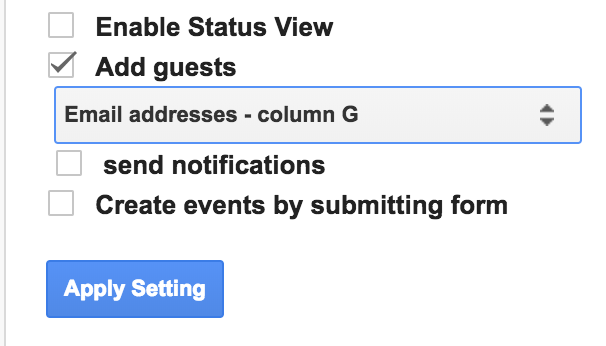 How to create events automatically by submitting Google Form? Step 1. Create a Google Form. Step 2. Create a spreadsheet for responses in Google Sheets. Step 4. Check ✅Create events by submitting form . Then click Apply Setting. How to view created events? Step 3: Select a column to view created event(s) hyperlink. Step 4: Click Apply Setting. How to fix events that are not being created on the Google Calendar? Solution 1: Check if the event time is valid. If the event date/time is invalid, event will not be created on the calendar. Note: Event start date/time should be sooner than the event end date/time. Solution 2: Select the correct column for the event time. How to fix "ScriptError: Authorization is required to perform that action"? If you encounter this issue, you could try close all Chrome/Firefox/Safari windows, and only open one account at a time. 1. First solution: Clear your browser's cache & cookies. - On your computer, open Chrome browser. - At the top right, click More. - Click More tools and then Clear browsing data. - At the top, choose a time range. To delete everything, select All time. - Check the boxes next to "Cookies and other site data" and "Cached images and files”. I need to be able to send an email invite to multiple people, how to do that? 2. Second, check ✅ Add guests to select the column that contains the email addresses. ⇨Then, select the column that contains the email addresses to send an email invite to multiple people. • Email addresses: Use a Comma as a Separator. 3. Third, check ✅ send notifications. 4. Finally, click Apply Setting. How to fix wrong time in calendar event creation? 1. Change your spreadsheet's timezone and Google Calendar's timezone to your current timezone. 2. If the first solution doesn't work, try to change your spreadsheet's timezone and Google Calendar's timezone to Eastern Time. 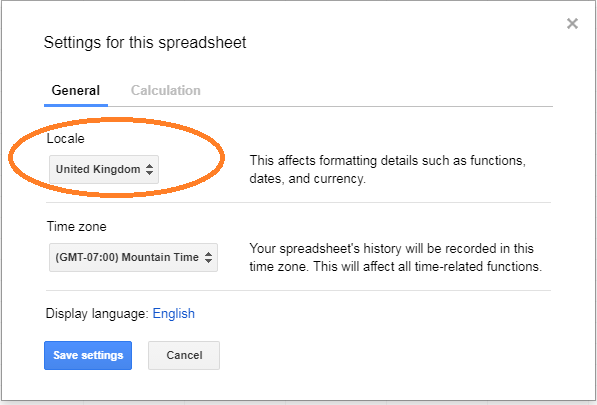 To change your spreadsheet's timezone, choose File ➡️ Spreadsheet Settings... Then, select (GMT -05:00) Eastern Time on Timezone field. How to add video call to events the add-on created automatically? On the top right, click Settings menu icon ⚙ ➡️ Settings. Select Event settings on the left side bar. 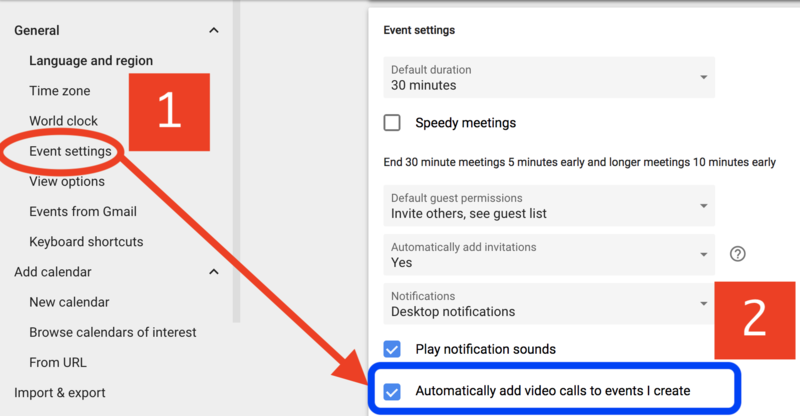 Check Automatically add video calls to events I create. If you do not want to add video call to events automatically, just uncheck Automatically add video calls to events I create. The add-on stops working, please help! It is possible to simply start over. You can remove the add-on and then install it again (at no charge). Choose Calendar Events Creator add-on from the list. On your computer, open a spreadsheet. Click Add-ons and then Get add-ons. Search "Calendar Events Creator", click the add-on on the result. To install the add-on, click Free. A message will appear requesting access to data that the add-on needs to work. Read the message, then click Allow. Re-installing the add-on will reset some settings. It doesn't change your plan or your quota. If you get this notification: "ScriptError: Authorization is required to perform that action", sign out of the other Google account(s) that you might have been signed into and clear the data browsing. Then, log-in using the Google account you have installed the Calendar Events Creator add-on. Do new lines in a document automatically get added to the calendar too or do i have to manually "create event(s)" each time? Yes, the add-on can create an event automatically for new line added to your spreadsheet such as pasted data, form submission data. First, refresh the add-on for your spreadsheet by choosing the Add-ons menu > Calendar Events Creator > Refresh. Then, open the setting by choosing the Add-ons menu > Calendar Events Creator > Set up. Finally, enable/check Create events by submitting form and Update event automatically. If they are checked, uncheck and check it again to re-enable the automation.